Last night, 2 people come to me to see if I would still be guiding in the morning. I tell them to catch me at my office and that I would be up early. A few friends come by in the morning as I make waffles and coffee. I chat and share waffles with W and S. K arrives as planned and we spend a few minutes getting organized. K is from Portland and was one of the players in a performance, Dirt Stage. We head up to the Grave of Vitus Bering, which stands near some especially find cedar stumps. The plan is to go cross slope in a reverse direction that I haven't gone before. There are drainages all along these hillsides that people who stay down on the "farm" are unaware of. Some of these are surprisingly deep. They also tend to have blackberries surrounding them. We run up against one and I take us uphill to round the thorn patch. When we hit the second, I take us up again onto what becomes quite steep and tangled ground. Again, I have led us to someplace I've not been to. The slope breaks back up above us just a few yards and I tell K that I need to go look at that. It is the diagonal road cutting across the slope. Again, we are close to the squatter's cabin, and K opts for a visit. As always, I stop before the cabin comes into view and let her go first to have a bit of discovery to herself. We talk about it. We climb up on the big boulder to see the view that the builder had before the brush grew tall. She is content to sit longer than I figured, which is okay with me. As we walk back we find that we have a mutual friend from Portland. At my office, something I hoped for happens. Last year, I told a story to a guy that I met at that years Lo-Fi. It was a story about a bully from when I was a Boy Scout, a story that came to mind as I held A's seed bomb in my hand. A story about an egg duel, cheating, and just deserts. He asked me if I knew what happened to that bully, and I did not. When I got home I began to wonder if that guy knew the bully (because I used his real name - since it was such a unique and proper name for a bully). I looked the bully up and found that he lived about 10 miles away from Smoke Farm (we were both from Minnesota). Well, the guy did not know the former-bully, but it was a fine end to a story that took a year to tell. 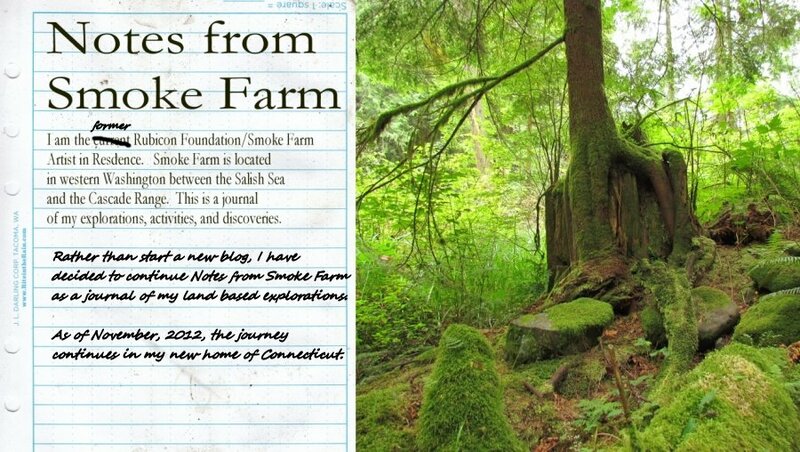 That is Smoke Farm, more than you might think. It is the day of the festival. I am up at 6 am. All year, I have woken up when the light arrived in the valley. I head over to my Guiding office and brew cowboy coffee and make waffles - I have brought my waffle iron as a luxury for the weekend. I take a short morning walk and find Mimi Allen laying limp in an upholstered wheelbarrow reciting poetry. I move her 50 or 60 yards enjoying the poetry and thoroughly strange experience. I leave her sideways in the road where no one can avoid her. Lo-Fi is off to a fine start. My friends from Eugene, C and J, arrive early as I told them to, because they did not have advanced tickets. I give them a little run-down on how the event works as they find that the planned information is a little too little (which is not necessarily a bad thing). After setting up their camp, they return to become my first guiding clients for the day. We head up the creek as I had done yesterday, and we bust the brush, as I had done yesterday, but instead of a cross slope hike, we turn uphill. It is a deeply cut deer trail, almost as incised into the hillside as if it had been done with a shovel, that turns us onto ground that I am not familiar with. We find a nice nurse log that is near 6 feet in diameter at the base. It is a place for a mossy rest. Higher up we hit more dense brush, a bit of a crawl with a bit of swearing on my part, but one complaint on theirs'. Finally we come out on the diagonal road near the great twin stump. We take in the squatter's cabin while we are in the area, and then drop down the diagonal road to the river. I point them upriver toward some art installations and then I head back to my desk to wait for more clients. I find myself sitting alone at my desk for some time. People are more leisurely about arriving at Smoke Farm than I am. My specimen wall has few visitors, so far. I would like to see the other art, but I feel that I have to be here for anyone that wants to go into the forest. Very very few people that come to Smoke Farm for any reason ever go off the beaten track, and I am aware that I am a rare opportunity to see something that almost no one else will see. Eventually, visitors begin to find the wall. They spend time with it and it works. My artful insecurities disappear. I wait for clients. I have also been incorporated into Tess Hull's Questing box project. She has seven chapters of a story hidden in boxes that people must find. Each box tells you how to find the next. Chapter three sits on one of my specimen boxes. It tells you to find me in and that I will take you to chapter four in exchange for a story about being lost. I have hidden the box up the creek on the prettiest of nurse stumps, but no one will ever find it without me. It isn't until about 5 in the afternoon that someone comes to me to find the box. I take M on the walk. He is having a great time. It is a good two hours after sunset when the next person finds me. They worry that it is too late to bother me, but it is not. I ask and they both have flashlights, so I we head out into the forest and up the creek in the dark. I stop in the creek bed and make them tell me their "lost" story. Then I point to the box. Like M, they are having a great time. This is Lo-Fi...you have to take part, you have to play one of the games to really appreciate the festival. It is the main artist set-up day for the weekend's Lo-Fi Arts Festival. A few dozen artists will be here installing artwork and installations throughout the 300+ acres of Smoke Farm. I have just a few minor things to do having installed my work earlier in the week. I walk out to the Grave of Vitus Bering and build a bench of split cedar fence posts that I have found lying in the forest. I set up my desk for my Guide Service to Wilder Smoke Farm. Then I have little to do. I can't deny that seeing all the people here is a bit uncomfortable for me. Watching them, I know that they have a different relationship to this land than I do. It's not that one is better than the other, it is just different. So, I have time to do something I have not done in too long. I have time to explore the forest one more time. This is what my Smoke Farm year has been. Wandering with purpose. Thinking about what I have found. I pack my gear and head up the creek. When I turn more north I plow through the densest of brush for 50 yards. I have forgotten how tough this spot is and wonder about my plans to guide people through here. But, the forest opens up soon enough. I find the big logging pulley and soon enough I find the broken bottle that lies under a fern. I've been here before and it amuses me that I can re-find such insignificant objects in the darkness of a rugged cedar forest. I hit the diagonal road not too far uphill from the squatter's cabin, which I continue on to. There is always a distant creative feel to the cabin and whether that feeling comes out of me, or goes into me from the site, it makes no difference. It is just so. Tomorrow, I might lead someone here. They will earn the visit. They will remember the better parts of the work. It is day 3 of the Smoke Farm Fortnight Camp. This year, fifteen or sixteen high school students are building a fire watchtower in one end of the first meadow under the tutelage of a small army of adult builders and counselors. It is an impressive group of kids, and an impressive group of adults. I think back to my summer camp experiences and while I wouldn't want to change much, to be involved building a complex structure like the tower would have been something big, for sure. One thing is for sure, these campers eat better than we ever did. The kitchen crew consistently makes food that one would be happy to find in a restaurant. Today, with the project well in progress, we break into teams to work on different parts of the structure. I work in G's team, which is laying out and preparing the upper deck so that it can be carried out to the site and assembled tomorrow. Everything has to be demonstrated to the campers, but it takes more understanding than patience. The automatic of the experienced tradesman is not automatic - I guess it never was. It goes to holding a tape measure properly and keeping the carpenter square "square" and making pencil marks that everyone else will clearly understand. But with each task, everyone comes along - they're less intimidated by the circular saw and when we double check the measurements, they're more accurate. I find it particularly interesting to watch them learn things that I learned so long ago that I've forgotten how I learned them. After lunch, I take two of the campers and A (who I'd hiked with up here during the winter) on a short hike. We don't get nearly as far as I thought we would (because walking through dense brush without futzing is also a learned skill) but we do get up to a beautiful spot on the creek where two very tall cedar stumps overlook us. Good enough.